St. Patrick Catholic High School prides itself on academic excellence. Our students excel in a faith-based environment which educates them with the appropriate values needed for intelligent and wholesome living; enables them to acquire the skills required for success in advanced studies; and challenges them to think and to act in such a manner as to enjoy life and to help make life enjoyable for their families and friends. We are a college preparatory school and offer a challenging curriculum, but our faculty and staff are committed to helping students grow and learn. 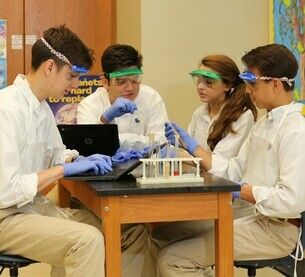 Furthermore, St. Patrick Catholic High School holds membership in four STEM programs. Students in grades nine through twelve participate in a 1:1 technology initiative wherein each student is provided a laptop to submit course assignments, access resources, collaborate with peers, submit assessments, and receive feedback from instructors. St. Patrick Catholic High School also offers seven Advanced Placement Courses and six dual enrollment courses where students may earn college credit while enrolled at St. Patrick. These courses simulate the expectations of college-level courses and are recommended for students who are eager to challenge themselves. These courses are highly regarded for their depth and quality. We proudly claim a 100% graduation rate and a 100% college-matriculation rate. St. Patrick graduates are offered approximately $8 million dollars in college scholarships each year. St. Patrick Catholic High School, founded in 2007, is accredited by AdvancEd and the Mississippi Department of Education. St. Patrick is affiliated with the Catholic Diocese of Biloxi and is a member of the National Catholic Education Association. Prayer and religious education are integral parts of life at St. Patrick. 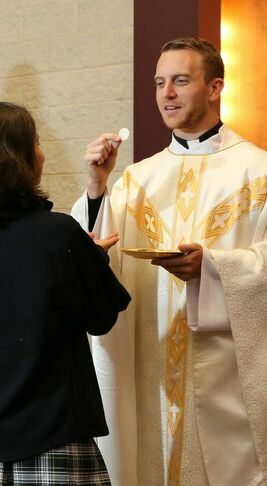 Students attend mass each week, on holy days of obligation, and on special occasions. Pastors and associate pastors of local parishes join students and faculty for mass throughout the school year. We also offer Reconciliation services during Advent and Lent, and Eucharistic Adoration throughout the year. The chapel on campus offers a quiet place for prayer and meditation. The theology curriculum outlined by the Catholic Diocese of Biloxi covers all aspects of the Catholic faith. Middle school theology courses include the study of Jesus, the prophets, the Gospels, the Sacraments, church history, and the Ten Commandments. The high school curriculum follows the U.S. Conference of Bishops curriculum which includes faith development, the Old Testament, morality, church history, social justice, marriage and family, and the Sacraments. The St. Patrick Campus Ministry Team sponsors spiritual retreats for each grade level during the school year and organizes and coordinates service club activities. Our theology department organizes and offers an annual March for Life pilgrimage to Washington, D.C., in conjunction with the Catholic Diocese of Biloxi. The Campus Ministry Team also works with our theology department in helping students find projects to fulfill their required community service hours. Christian scriptures are filled with accounts of our Lord Jesus’ loving concern for people and their needs. Perhaps there is no more touching episode than that of the feeding of the five thousand. “Five loaves and two fish are all that we have here,” said the Apostles (Matthew 14:13-20). And yet, they have made available what they had on behalf of others. The students who enroll at St. Patrick Catholic High School may not come to us with five loaves and two fish, but they bring with them their gifts, their talents, their energies, and their good-heartedness. Since the opening of St. Patrick, our generous-spirited students have donated thousands of hours of service on behalf of others. This has brought great enrichment to many lives and has called forth faith, character, and virtue in the lives of our students. Nothing is a more fundamental part of the curriculum at St. Patrick Catholic High School than an in-depth study of the Catholic faith. The religious studies curriculum outlined by the Catholic Diocese of Biloxi covers all aspects of the Catholic faith. Middle school religious studies courses include the study of Jesus, the prophets, the Gospels, the Sacraments, church history, and the Ten Commandments. The high school curriculum follows the U.S. Conference of Bishops curriculum which includes faith development, the Old Testament, morality, church history, social justice, marriage and family, and the Sacraments. St. Patrick students experience an intensive education in English and Language Arts. From reviewing basic grammar to writing long-form essays, from reading short stories and critically analyzing classic literature, St. Patrick’s language arts classes prepare students for college and beyond. Math classes at St. Patrick Catholic High School cover everything from algebra to trigonometry and geometry. Science classes at St. Patrick Catholic High School offer something for every student. Our science courses prepare students for engineering and medical majors in college. Accordion ContentFrom ancient world history to United States history and world geography, St. Patrick students receive a rich overview of history and social studies. ​St. Patrick Catholic High School prides itself on a variety of fine arts, physical education, and elective courses offered to students throughout their high school career.